When visiting Downtown St. Pete, whether it be for business or pleasure, odds are that travelers will choose to stay in either a hotel in the downtown core, such as the Hyatt Place, or in a hotel along Beach Drive, like the Vinoy or Hilton Bayfront. While these hotels vary in size and style, they have one thing in common: they are relatively close to the waterfront. And while staying on Beach Drive or near the waterfront might be perfect for some, many travelers would rather stay in the city’s edgier up-and-coming neighborhoods to get a down-to-earth view of how local residents live. So it comes as no surprise to us that there has been a lot of recent interest in new hotel development in more central areas of Downtown St. Pete. A few months ago, St. Pete Rising exclusively reported on a proposed 11-story boutique hotel for the heart of the already-trendy EDGE District. That hotel, which will feature around 130 rooms, will likely be flagged by an upscale brand such as Marriott’s Tribute Portfolio or The Unbound Collection by Hyatt. Now it appears that the EDGE District’s neighbor, the up-and-coming Grand Central District, could also see the construction of a new hotel. Menna Development, which developed the Staybridge Suites at 940 5th Ave S in the Innovation District, will soon break ground on a seven story hotel at 1650 Central Avenue. 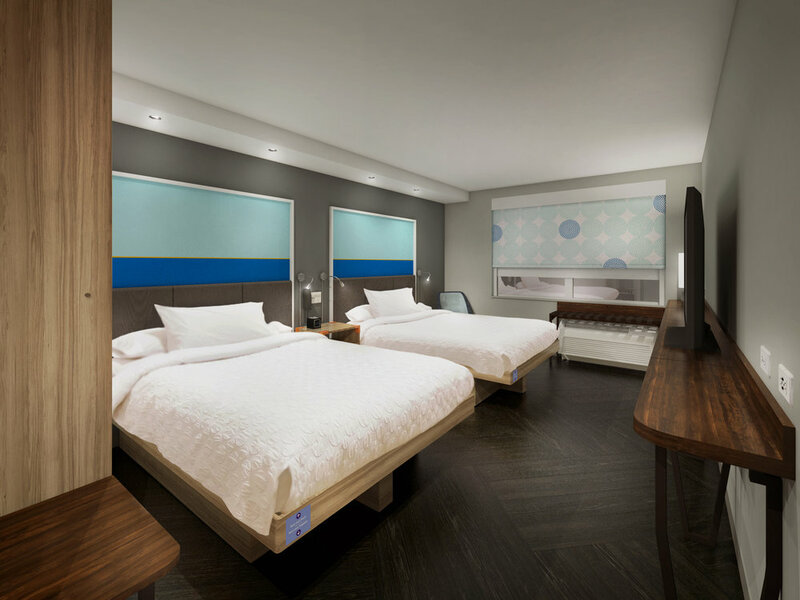 In planning for a hotel in the Grand Central District, Menna Development wanted to build a hotel that reached an underserved segment of the market with a brand that reflected the edgy vibe of the surrounding area. They felt that there were plenty of upscale hotels in the area, but Downtown St. Pete was lacking more affordable hotel accommodations. 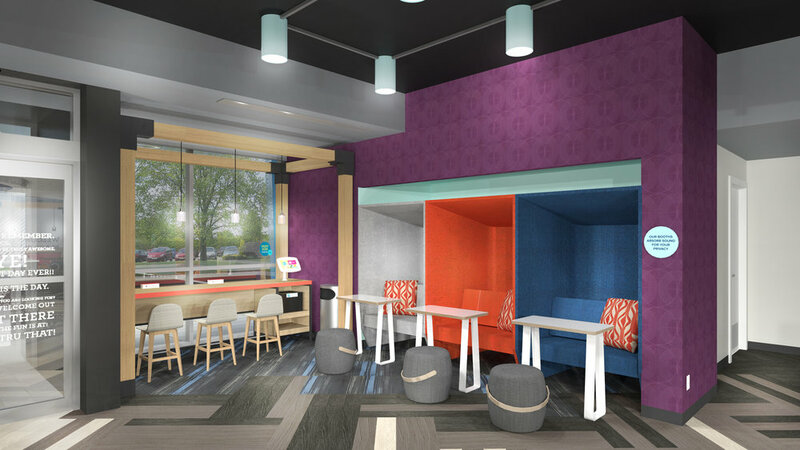 Tru by Hilton is a newer Hilton hotel brand that caters to travelers seeking affordable but vibrant and energetic accommodations. Rooms at Tru hotels are often slightly smaller and more efficient than your average hotel room, which allows costs to be kept down. Those savings are then passed on to guests in the form of lower room rates. For example, their rooms typically don’t feature dressers or full-sized closets. Instead they have a spot to store your suitcase and nooks to hang your jackets. In essence, Tru caters to travelers who want to explore their destination — not their hotel room. The Downtown St. Pete Tru by Hilton will be seven stories and have 132 rooms. In addition to the hotel lobby, the project will feature over 10,000 square feet of ground-level retail along Central Avenue. Without a doubt, this area is booming. Once the hotel breaks ground, it will join many new projects in various stages of development in the eastern portion of the Grand Central District. Directly across the street from the proposed hotel at 1601 Central Avenue, a six-story, 246-unit residential building to be called the Artistry apartments, is being developed by Milhaus Development. Demolition of the existing World Liquors building and accessory structures has begun and vertical construction is expected soon. Completion is anticipated in 2020. Artistry will feature over 12,000 of retail space on the ground floor along Central Avenue. Just west of the Milhaus project, NRP Group recently broke ground on a five-story, 243-unit apartment building at 1701 Central Avenue. That project will feature 5,000 square feet of retail space along Central Avenue. The NRP Group also developed two other apartment buildings in Downtown St. Pete: Beacon 430, at 430 3rd Avenue South, and Avanti, which recently opened at 201 4th Street South. One block north of Artistry, DevMar Development is currently constructing an 11-story, 211-unit apartment building being called the Vantage Lofts. That project also features over 7,500 square feet of ground-level retail fronting 1st Avenue North and 16th Street North. In total, over 700 residential units are under construction in the immediate area around Menna Development’s proposed hotel. These projects will likely add hundreds of new residents and visitors and thousands of square feet of retail space to one of the fastest growing areas of St. Petersburg.